The location still has its many old advantages: its proximity to the beach and beautiful La Jolla, its own parking lot, a super patio, and a comfortable main room with a large bar. I think they would benefit from better signage, and the acrylic bar top with (by now fossilized!) malted barley visible underneath is looking a little tired. But otherwise, the decor and design are quite good. It has some new advantages, now, too: The new ownership and management are really nice people, and they are eager to create a good experience for you. Service at the bar was friendly, quick and informative. In addition, several of the principals came by to chat even though they were having a very busy day. When I told them about this blog they were excited to share their various beers with me, including some things that were still in the brite tank--a treat I always enjoy. They are doing everything they can to erase the old memories people have of the usually-not-great beer brewed by former occupants of the location, including completely replacing all the draft lines, and even the valves and other hard-to-clean parts of the brewing system. And the kitchen has stepped up to a new level, too. Overall, they are not quite there, yet, though I expect they will be soon. 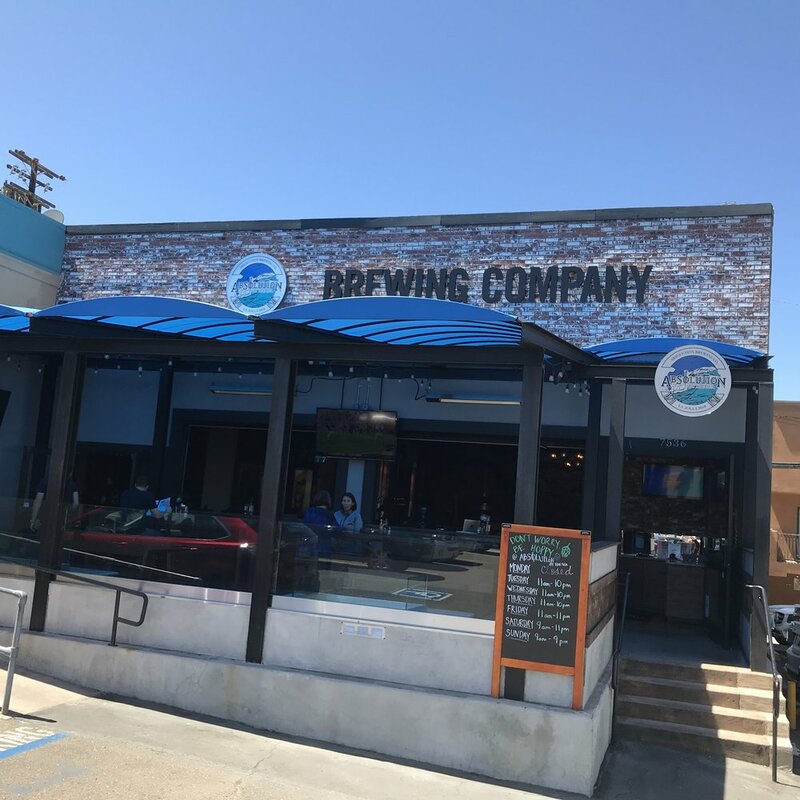 The beer brewed at their Torrance location is solid by all accounts, and there is plenty of it on tap. As of right now, there are only a few offerings of beers brewed locally, but those offerings will continue to increase as they ramp up production here. Unfortunately, I found a couple of those La Jolla-brewed beers to have minor flaws. On my palate, a smoky flavor in the lager was off-putting, and others got a band-aid taste--that's a phenolic off-flavor according to the handy-dandy internet I carry in my pocket. As I've since learned, one cause of phenolic off-flavor is chlorine in the water--or, as I suspect may be the case in this instance, too vigorous cleaning of the old brewing system and not enough rinsing. Those kinds of issues will be worked out--these guys are very experienced brewers. Other beers I tried didn't have that flaw and were pretty tasty. I plan to go back when they have more local beer available, and I'll update this review then. In the meantime, they deserve your support to turn this into an awesome craft beer destination in the heart of La Jolla. Speaking of the brewing system, craft nerds will be interested to know that it is the oldest system still operating in San Diego. (The system at Karl Strauss downtown has been replaced since they opened.) That's a lot of San Diego beer history.